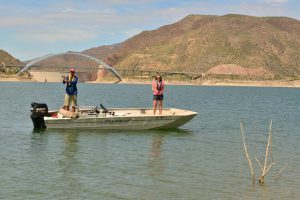 PHOENIX – Safe boaters are educated boaters, that’s why the Arizona Game and Fish Department (AZGFD) is encouraging all watergoers to take a boating safety course during the national Spring Aboard campaign March 18-24. Spring Aboard is a national campaign coordinated by the National Association of State Boating Law Administrators (NASBLA) to encourage the state’s boating and watercraft users to complete a safety education course. AZGFD offers free monthly classroom courses in Phoenix and Lake Havasu City to provide water users the information and tips needed to stay safe while on the water. The department also offers pay and fee online courses. In 2016 nationwide, nearly 40 percent of the 701 watercraft-related deaths involved a vessel where the operator had never taken a safety course, according to the latest U.S. Coast Guard statistics. It’s with that statistic in mind that NASBLA developed and produced Spring Aboard, utilizing a grant from the U.S. Coast Guard.